Thanks to Martin Brinkmann at ghacks.net, I stumbled across a possible replacement for the excellent Windows Update MiniTool, aka WUMT. It’s from a developer who goes by the name of a Disney character, David Xanatos. The program’s name is Windows Update Manager, aka WUMgr. The program’s readme file says “This tool is inspired by the Windows Update Mini Tool, however in contrary to WUMT it is written in .NET instead of C/C++ and it is Open Source; those [sic: thus] it’s [sic: its] continued maintenance is enured [sic:ensured].” Like WUMT, WUMgr is written to the Windows Update Agent API. It actually looks almost exactly like WUMT, too, as the following screenshot shows. Thus, I must ask the question: Can WUMgr replace WUMT? Those familiar with WUMT will recognize WUmgr’s look and feel as a nearly exact replica. Why Ask: Can WUMgr Replace WUMT? 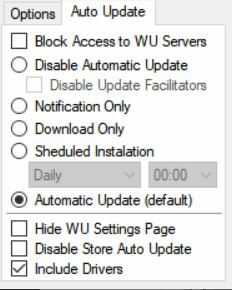 WUMgr lets user selectively block access to WU Servers, disable Automatic Update, and even, disable Update Facilitators. This makes the WUMT wrapper script needed to turn WU on and off unnecessary. Because WUMgr can completely disable WU, I think it’s got some chops that WUMT lacks. The only way to use WUMT likewise is via a so-called “wrapper script.” Only then does the script handle those functions independently. Contrariwise, WUMgr brings them into the GUI, and makes them easy to enable or disable as needed. Is WUMgr Ready for Prime Time? I can’t really say yet. Fact is, I’ve only been using the program for 5 days, and I haven’t had much chance to exercise it. But I’m going to be using WUMgr as heavily as I can going forward, and I’ll follow up here — and possibly also on Win10.Guru, where my WUMT overview is the most-visited piece of content there — as I learn more. Stay tuned.